The spring/summer 2008 edition of CIH magazine contains a comprehensive article charting the Tocketts Mine story. The mine itself appears to have been considered a failure, yielding poor or little stone, which must have been badly received by the promoters bearing in mind the amount spent on the development of the site. Does anyone know how the mine was linked up to the Eston mines complex waggon way? I have read somewhere of a wooden bridge somewhere but there does not seem to be much in the way of evidence ‘on the ground’ so to speak. Tocketts was connected to the local rail system by a standard gauge siding which left the Chaloner Pit branch at a point above Howlbeck Mill Farm, crossed Wilton Lane by a timber viaduct and then along the side of the valley below Howlbeck Farm to Tocketts Bridge where B1269 Redcar Road was crossed by another timber viaduct which carried the line onto the opposite side of the valley, and its course to the pit and the shafts then ran within what is now the established conifer wood below Tocketts House. The earthworks can still be seen from the bypass, between Howlbeck Farm and Tocketts Bridge but the viaduct materials will have been ‘recycled’ after closure. In view of the poor returns from the pit, the railway connection was very short lived and probably none of the infrastructure realistically worth building. 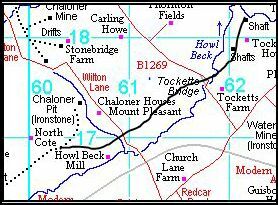 The Chaloner Pit branch itself only lasted until 1914 by which time the mine’s output was going first by narrow gauge tramway later via underground route directly linked to Eston Mines, and down the inclines to California at Eston. More info in the CIH magazine as posted by Matthew, and various books and publications on the Cleveland ironstone industry. See also map at https://sites.google.com/site/waggonways/nz/55/nz5515 although the branch is missing from this map and needs to be added in by its creator.